Der Artikel Solomon Burke: Best Of Solomon Burke (180g) wurde in den Warenkorb gelegt. The late great "King of Rock 'N' Soul" Solomon Burke was an American original. His music has touched millions of faithful followers due to his angelic voice drenched in gospel, soul and rock and roll. Not only did he sell tons of records worldwide, but many superstar acts like The Rolling Stones and Tom Petty have also paid tribute to the man with their renditions of his classics over the years. 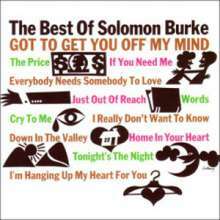 In 1966, Atlantic Records assembled one truly amazing collection of hits, which has been out of print on vinyl for over four decades entitled The Best Of Solomon Burke. Featuring twelve of his most loved Atlantic Records era recordings from 1960 to 1966, the album boasts such soul classics as Cry To Me, Everybody Needs Someone To Love, Just Out Of Reach, and Got To Get You Off My Mind. It is with much respect and honor to announce that Friday Music will be releasing a limited edition 180 Gram Audiophile Vinyl of this incredible masterwork. Mastered from the original Atlantic Records tapes by Joe Reagoso at Friday Music Studios and Capitol Records in Hollywood, CA, The Best Of Solomon Burke is truly a classic soul masterpiece now impeccably revisited in the audiophile domain. These original sessions were produced by the legendary Jerry Wexler and Bert Berns, and engineered by Tom Dowd. For this special limited edition release, we have included all the original Loring Eutemey artwork restored faithfully as well as a poly sleeve to protect the cover and a poly lined LP sleeve to preserve the vinyl for years to come. Solomon Burke - The Best Of Solomon Burke... from your friends at Friday Music... 180 Gram Audiophile Vinyl... Long Live The King Of Rock 'N' Soul!